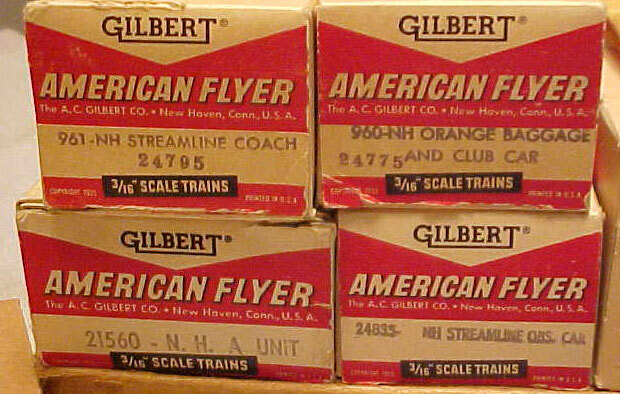 The four orange-stripe streamliners with metal name plates were made only in 1956. 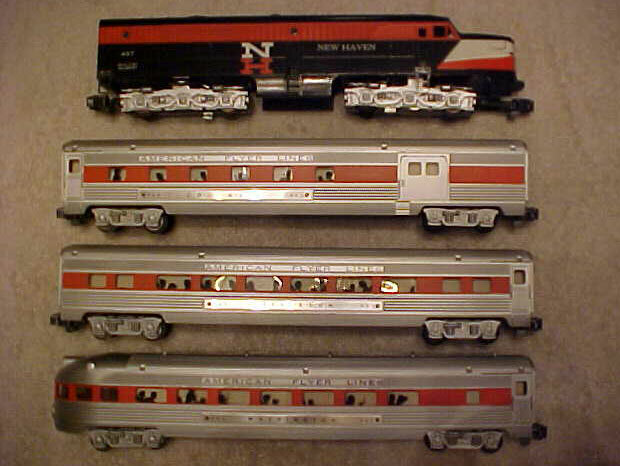 These cars were sold in the #5670TRH New Haven Clipper set in 1956. Leftover inventory was sold in 1957 as set #20070. It is one of my favorite sets. Here's the whole train on my layout. The set was pulled by #4945 twin Alco engine set, also made only in 1956. It comprised the #494 powered engine and #495 dummy with railsounds and horn. #4B 100-watt Transformer with plastic case, and #708 Air Chime Whistle Control Unit. 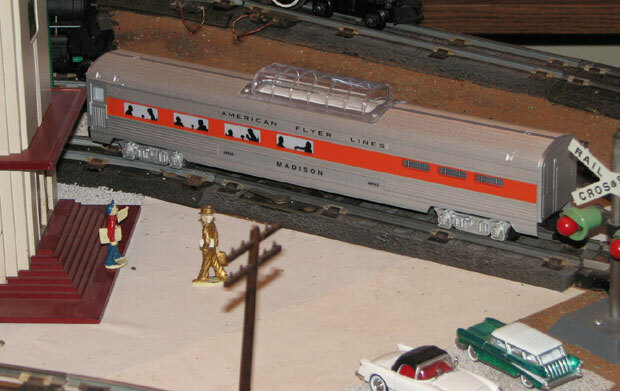 In the transition year of 1957, some of the leftover inventory of these cars were sold in the #20340 New Clipper set, and in the #20940 New Clipper for Export set. Both were pulled by the #497 New Haven Alco. The interesting thing about this set is that it was sold in 1957, the year of transition to 5-digit numbers. The engine and cars are the 3-digit version (as the books say they should be), but they're in 5-digit boxes. In the early years of 5-digit catalog numbers, cars and engines often came in boxes from unsold inventory with 5-digit numbers stamped on boxes already stamped with the 3-digit number, even though the car inside bore the 3-digit number. When there was no box in inventory, the 3-digit car or engine was put in a new box stamped with only the 5-digit number. Notice also that the box numbers are not as you might expect: when a car was packaged for sale in a set, Gilbert gave it a different number than when it was sold separately. But the billboard horn is in a 3-digit box, whereas the books say it should be a 5-digit. 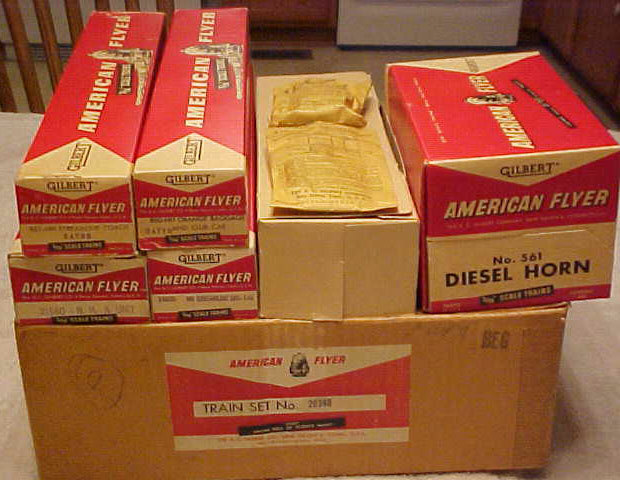 To give the company maximum flexibility, the catalog didn't give a number for anything in the set except the engine, which it listed as #21561, even though the picture in the catalog showed a #497 and some of the engines shipped in the #21560 boxes were #497s. 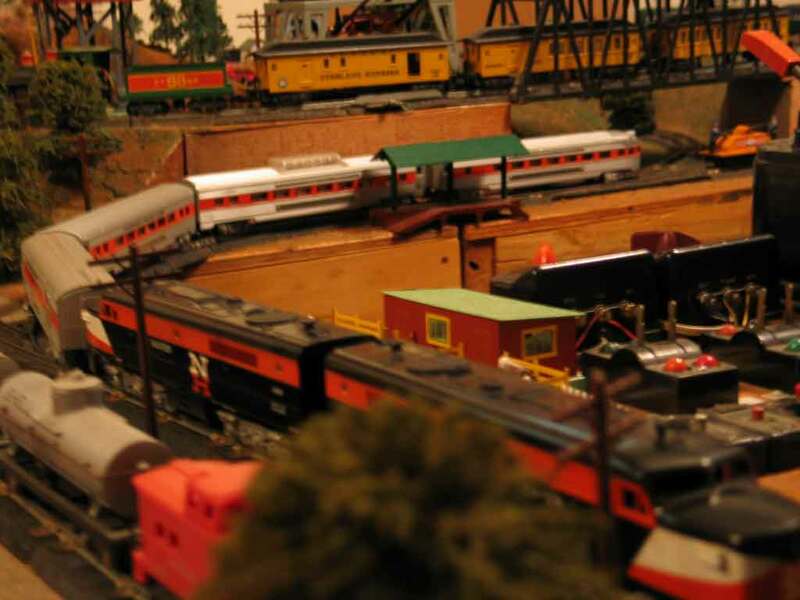 The #20340 set also included 12 #26720 Curved Track, 4 #26700 Straight Track, #26752 Remote Control Uncoupler, #26690 Track Terminal, and #22020 50-watt Transformer. The #20940 set included the same, except for a 220V transformer in place of the #22020. #48943 Madison dining car made by Lionel in 1996.
but it looks great with the original Gilbert set.